More than 1000 emails have piled up in my inbox. Last week I missed an appointment because I forgot it was Tuesday. I didn’t forget that the meeting was Tuesday, but that Tuesday was Tuesday. Our Christmas tree still sits in a box in the shed. I haven’t bought a single gift, and when I think of shopping, I want to curl up under the Pendleton blanket Henry and I received as a wedding gift (thank you card not yet sent) and nap until my responsibilities vanish, or until so much time passes that those on the receiving end forget that I owe a card or phone call or email or invoice. And yet, anyone looking from the outside (outside my head) would describe the last several weeks as a time of great creativity and productivity. 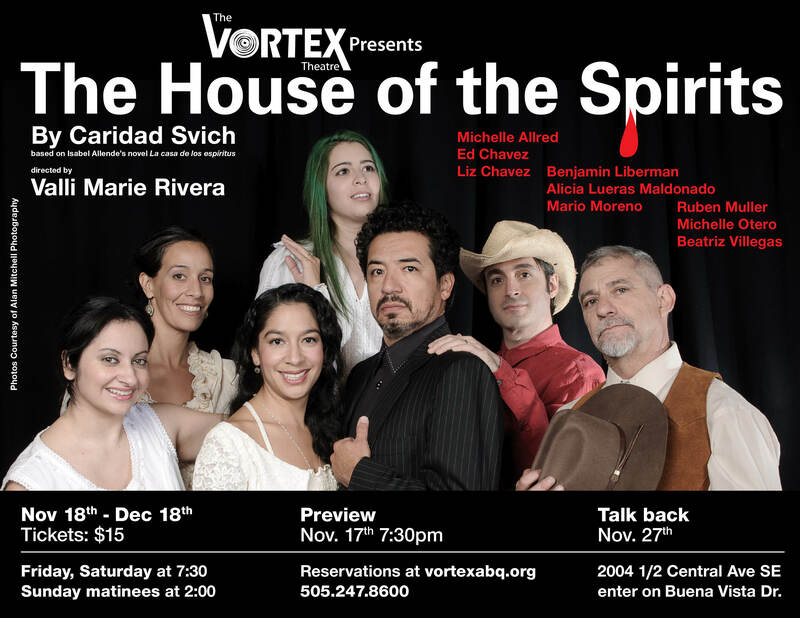 I am playing four characters in The Vortex Theatre’s production of “The House of the Spirits” by Cardiad Svich, directed by Valli Rivera. The rehearsal process was intense, fifteen hours a week, Monday through Thursday nights and Saturday afternoons. We’ve had nine shows; six more to go. My theatre experience in Albuquerque has been limited to one-weekend or one-night runs, so I’ve had to pace myself, to grow into Nívea the mother and Tránsito the whore, not to mention the woman in the campo and the woman in the city. Last week I facilitated a storytelling workshop at a statewide convening of Kellogg Foundation grantees, incredible people working to ensure that New Mexico’s most vulnerable children are healthy, well educated, and economically secure. Attendees in my workshop wrote “I am From” poems, heartfelt poems that spanned from Puerto Rico to El Paso to the Midwest to Russia, from enchiladas to sweet peaches to Wonder Bread. The workshop and subsequent small and large group conversations affirmed my belief that stories can save us, that there is a meaningful way to engage in community and it begins with a simple act of listening. I made sourdough stuffing and pumpkin cookies for our Thanksgiving feast. Henry and I hosted a pirate party for K.’s birthday party, complete with a plank, a pirate flag (one of the few decorative touches to remain standing in our yard after last week’s windstorm), and a treasure hunt. Thanks to Chrissie Orr and The Academy for the Love of Learning, I am now officially one of eight El Otro Lado teaching artists. Each of us has partnered with a Santa Fe Public Schools classroom teacher to bring this art and storytelling workshop to students from elementary through high school. Beginning in January, I’ll visit Sonya Gunther’s junior and senior English classes at Capital High, and together, she and I will educare, or draw out these young people by sharing with them tools to tell their stories. So why do I feel like a flake? Why a “flake”? Maybe because like a lot of people, you assess your accomplishments only in terms of what you haven’t done, discounting what you have? Or maybe what you haven’t done is what you’d like to do more than anything else but it got pushed aside temporarily? Who knows? In any case, you gave a lovely gift to our city in your performance in House and we thank you.